The tetraploid revolution in iris breeding that started to really expand in the early 1920's resulted in an explosion of new colors during the 1940's. One of the most celebrated of the era was Dr. Kleinsorge's 1948 introduction 'Sunset Blaze'. A blazing red-orange heavily infused with bright gold, it perfected a color class that only been hinted at before. It was bright, flashy, and very tall so it really made a strong statement in the garden - and it still does. 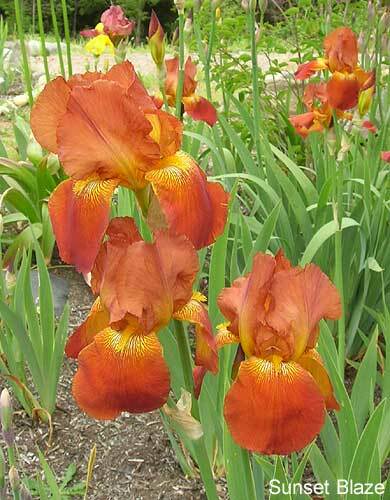 It is an extremely hardy iris that increases well and seems to grow everywhere with little care. An early bloomer in my garden, it starts the Tall Bearded season off with a bang. Click on the photos for larger views. Cooley's Gardens catalog for 1948 described it as: "A tall and huge golden flame-salmon blend, almost a red, but with so much of the gold influence in it that it is not really a red Iris. You have seen the sun look much like this just before it sinks over the horizon. Both standards and falls are extra large and the haft and beard are bright golden yellow. A most impressive flower, blooming early on widely branched stalks reaching 42 inches." It won an Honorable Mention and then the Presidents Cup at the AIS convention in 1949, and went on to win an Award of Merit in 1951. 'Sunset Blaze' was one of the first of Dr, Kleinsorge's irises that I had in my early days of growing irises, and it fueled a passion for finding all his others. 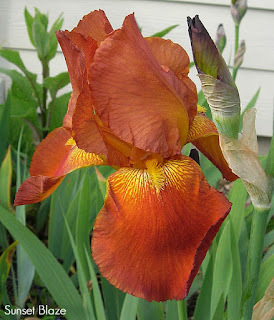 If you enjoy hot colors in the garden that give an instant fiesta effect you will want to add this fantastic historic iris. It looks fantastic with reds, browns, golds and deep purples and blues, bringing a rainbow of sunset hues to enjoy throughout the day. This timeless classic has so many good qualities, it is easy to find and will be around for many decades to come for iris lovers to enjoy. Consider adding it to your collection. You won't regret it.